I'm a huge sucker for deals, and I patiently waited until Desio had another buy 2 get 1 free deal. This time around, I knew what I wanted because I previously made an order from Desio 4 months ago. Last time I purchased, was actually my first time, and I got Smokey Grey, Icy Blue, and Desert Dream. On my last purchase, I received my package about 2 weeks later. This time, I don't know how, but I got my package within 4 business days. (Ordered Thursday June 18, received it Wednesday June 24) I don't know how, but it happened. Because of my previous order, I knew what colour I really loved and what I had to reorder. 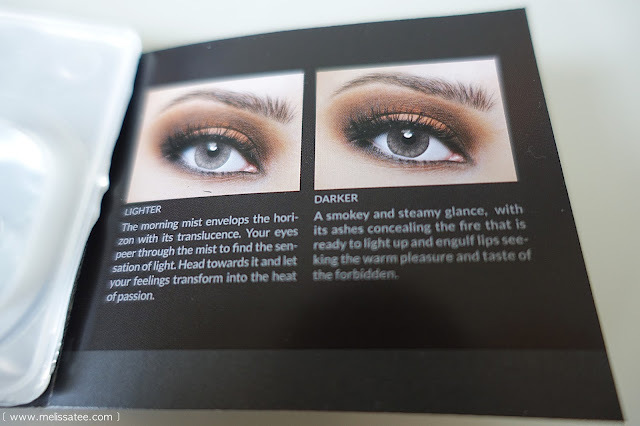 This review will be on the Two Shades of Grey (lighter/darker), and I show you a glimpse of Smokey Grey. 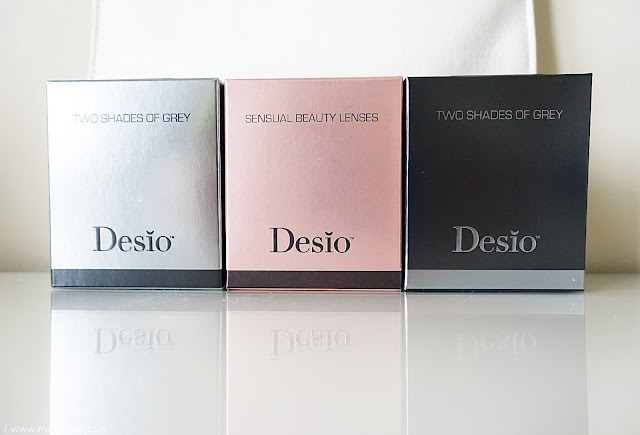 I won't really be reviewing smokey grey again because I already did in my first desio post, but I have a few pics of it in this post. 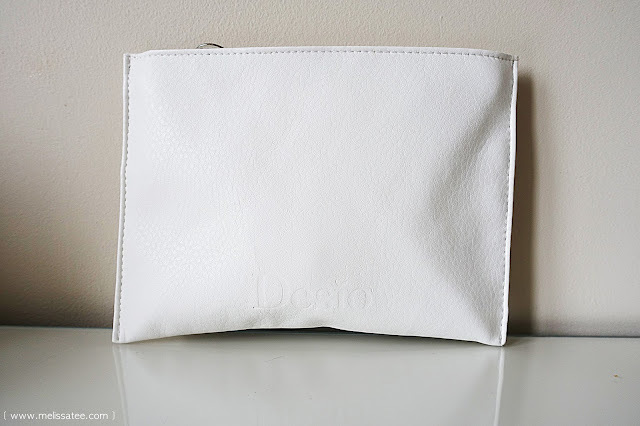 This time with your buy 2 get 1 free order, you also received a cute white pouch with the Desio name printed on it. It's of pretty nice quality, a nice pleather material. 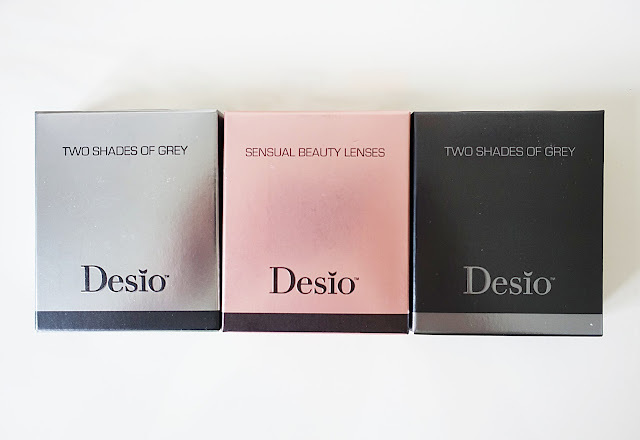 I had high hopes for the Two Shades of Grey line, because the Smokey Grey from Desio is my absolute favourite. I get so many compliments on how nice my eyes are, and how beautiful/natural it looks. 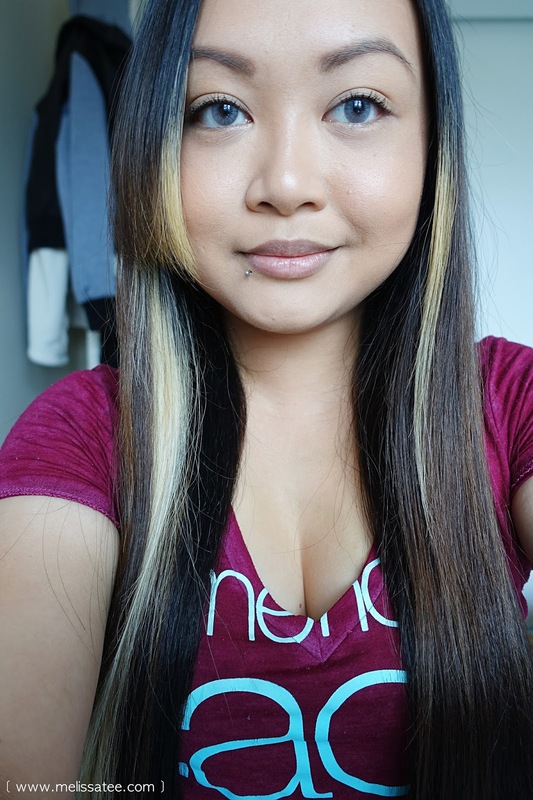 Crazy how some people actually think it's my real eye colour, I mean, considering I'm asian an all haha. Its weird, my camera always makes my grey contacts come off as blue, I can never figure out how to fix that. 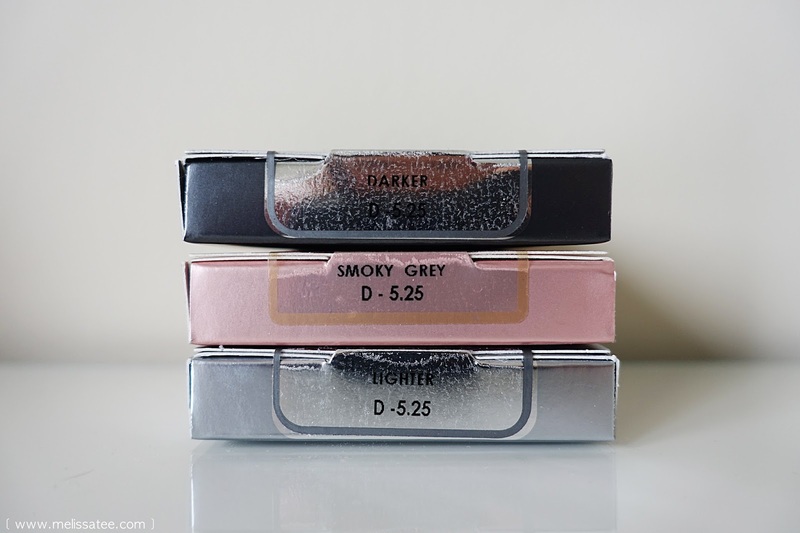 The lighter grey is gorgeous, but compared to the smokey grey, it doesn't look as natural, to me at least. If you look at smokey grey, you can see there's a lot more attention to detail with those contacts. It has more of a prominent starburst effect on the grey part, kind of making it blend nicer with your pupil area. 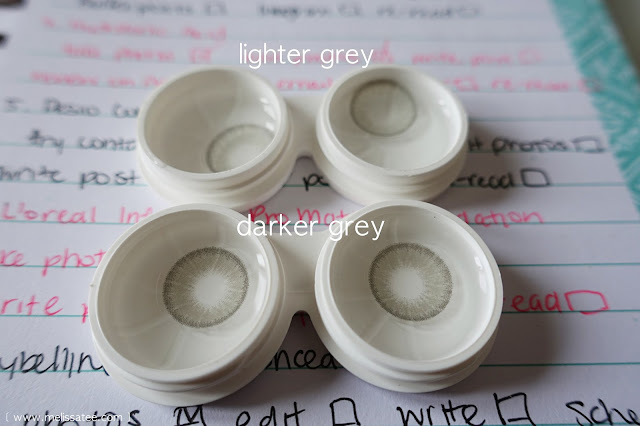 Lighter grey has a little starburst, and the ring around the colour is a lighter grey than smokey grey. They look fairly similar from afar, but you can see the difference up close. Smokey grey's colour part isn't as solid as lighter grey's either. Out of the two shades, I prefer the lighter grey over the darker. In the packaging it looks exactly the same as lighter grey. Darker grey looks exactly like lighter grey, but darker, obviously. It has the same style of starburst, and the ring around the lens is a darker grey. I don't know if it's always when there's a buy 2 get 1 free, but the darker grey lens kind of irritated my eyes, and I couldn't wear them for long without my eyes watering. Last time I purchased with this deal, my Desert Dream pair were terrible. I couldn't wear them for more than 2 minutes and my eyes were watering and irritated like crazy. I don't know if they always have 1/3 defected when you purchase 3 pairs .. but who knows? I think I can still get wear out of them, only one lens bothers me, so maybe it's fixable if I cleanse it a lot before use. As you can see, they look almost identical. Lighter grey has almost a blue/silver tone to it. Darker grey has blue but also a charcoal/smoke grey shade to it as well. I honestly have been loving lighter grey. My all time favourite still has got to be Smokey Grey though. Hands down, best grey contacts I've ever worn! 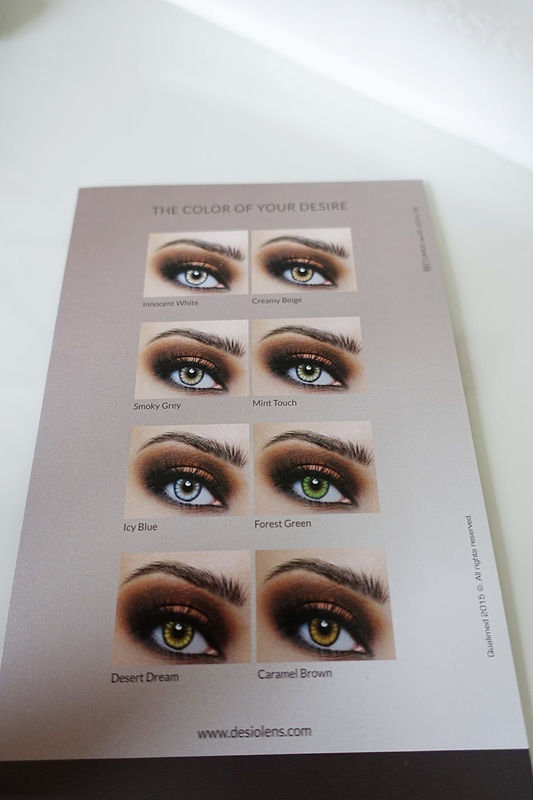 What shade do you love from Desio?